Discussion in 'OS X Mountain Lion (10.8)' started by psharp, Mar 7, 2013. There may be a better location for this thread but I couldn't find it as it applies to lots of topics. 45gb of space have been removed the the OS Macintosh HD (down to about 205) and been made "available". Also, and I don't know if this is normal or not, but the drive is no longer OS extended (journaled). I tried partitioning out those 45gb and get the error "target disk is too small for this operation"
Now the computer works and I'm not totally out of memory yet, but there's still an issue here. 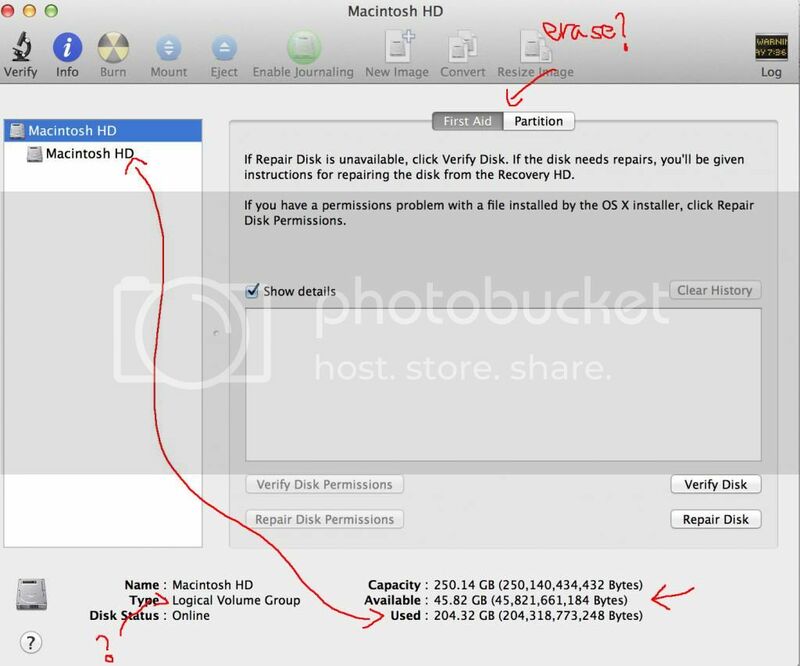 Ideally I'd like to stuff those 45gb back into the normal mac partition without reformatting (apple support said it couldn't be done, but the guy didn't really sound very convincing) I'm hoping maybe someone here who a vaster extent of diskutl might be able to shed some light. I'm in the process of arming myself with a mountain lion install usb which I may use at some point tomorrow, hopefully it will let me completely reformat the drive, I'm scared that it won't though. Edit: So booting from an USB install drive also doesn't give me the options to erase the entire disk, at least not with disk utility. Hmm yeah that does seem odd. My first guess would be to try just using diskutil through terminal. If that doesn't work you could probably try a 3rd party disk aid tool.